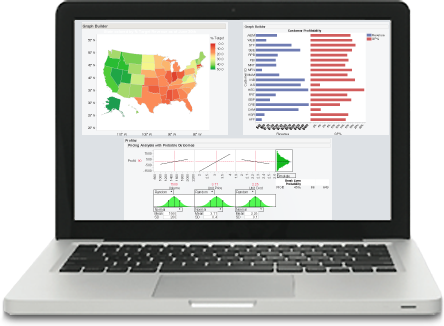 JMP® software from SAS combines powerful statistics with dynamic graphics, in memory and on the desktop. Because everything is linked – the graphics, statistics and data – JMP encourages you to dig deeper and ask more questions. With JMP, analyses unfold, driven by what the data reveals at each step. And you can explore your data without leaving the analysis flow. Not ready to make the purchase? Try JMP® Free for 30 days by downloading our free trial. Regardless of your analytical savvy, you can use JMP to uncover answers that spreadsheets often hide. Embark now on your journey of statistical data discovery – and see what your data is trying to tell you. Discover white papers, customer stories and more when you explore the JMP website.